Cleveland Indians starter Mike Clevinger was able to keep the Houston Astros lineup in check through four innings, but he had to go through the top of the lineup for a third time and it didn't go as planned. 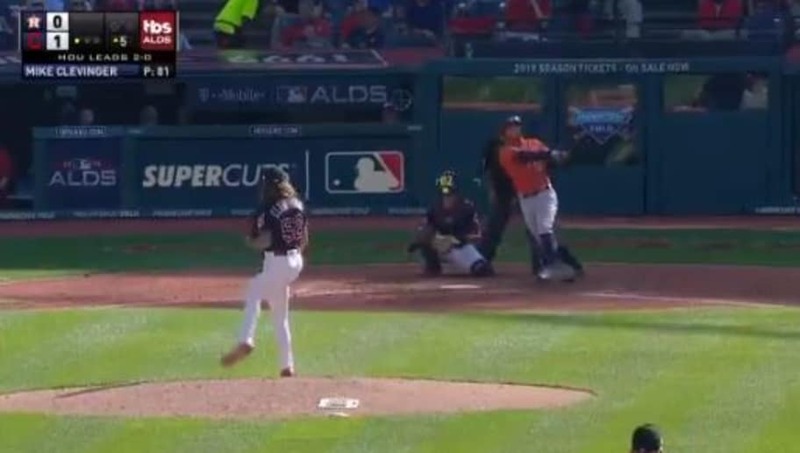 Clevinger has been able to blow his fastball by Astros hitters, but he missed location with a breaking ball to leadoff man ​George Springer and he made him pay with a monster​ shot to left. ​​You throw a hanger on the first pitch and most hitters are going to capitalize on that mistake, especially these Astros boppers. Springer's game-tying homer was his ninth career postseason home run, which is a new franchise record. ​​That is Springer's ​second homer of this postseason, and it really turned his afternoon around after striking out a couple times against Clevinger. This could be swing that gets the Astros offense going today, and if they come all the way back and win, they will be heading to the ALCS to face either Boston or New York.